Almaty, the former capital of Kazakhstan and home to ~2 million people, is a rapidly growing, vibrant city, beautifully situated at the foothills of the mighty Zailisky Alatau, the northernmost mountain range of the Tien Shan at this longitude. The city sits on a huge alluvial fan with the snow-capped mountains in the background, reaching 5,000 m elevation. Almaty has suffered from earthquakes in its young history: in 1887, the Verny earthquake with a magnitude of about 7.3 had its epicentre a few kilometres west of the city but did not produce surface ruptures (Verny is the old name of Almaty). Only two years later, the M8 Chilik earthquake ruptured the surface 100 km to the southeast of Almaty. Finally, Almaty was heavily damaged by the 1911 Chon Kemin earthquake with a magnitude of ~8, which occurred on the southern flank of the Zailisky Alatau. In our new paper we now report on a fault that did not rupture in historical times, but surely did so in the Holocene – and this fault is right beneath the city. Almaty, home to approx. 2 million people, sits right on a major fault. 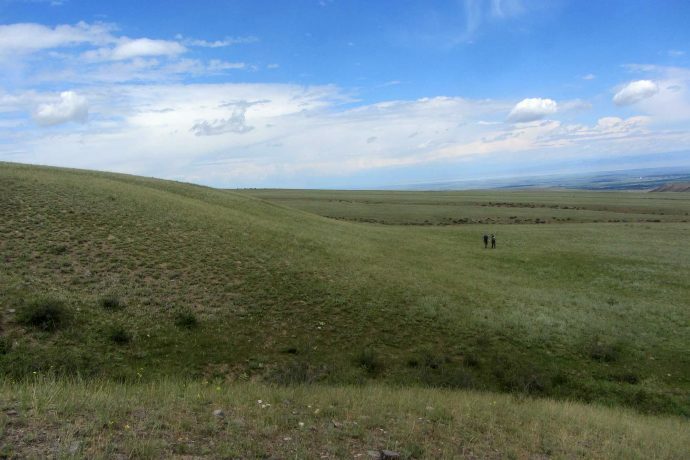 We investigated the more than 250 km-long range front fault that separates the Zailisky Alatau from the Kazakh platform using field mapping, modern and historical satellite imagery, stereo satellite data, and drone aerial photos from which we computed high-resolution terrain models. We found Holocene fault scarps offsetting river terraces and alluvial fans. Some of these scarps stem from single large earthquakes, while others are so huge that they must have formed in repeated earthquakes since the end of the last glacial maximum. None of the quakes that we identified happened in historical times. At one site we were able to measure the slip rate of the range front fault for the first time – thanks to a couple of nice bits of charcoal in a fine-grained layer. Displaced river terraces show that the fault slips 1.2-2.2 mm/yr averaged over the Holocene. This scarp offsets an alluvial fan by ~10 m.
The Big Almaty Canal is built right on the fault scarp in many places. We also found fault scarps that are situated in the foothills, and relatively young uplift and deformation in the forelands – indicating that several seismic sources may be active at the same time, although the foothill fault seems to be the most active structure today. Recent uplift and incision are caused by folding and blind faults in the forelands. 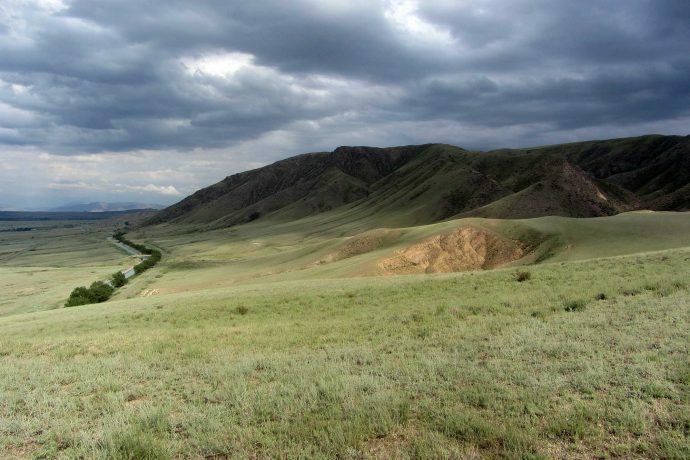 The Almaty range front is a rather difficult place for these kinds of studies compared to other parts of the Tien Shan. First, a thick loess layer covers the foothills, which makes it difficult to directly access and measure offset markers. 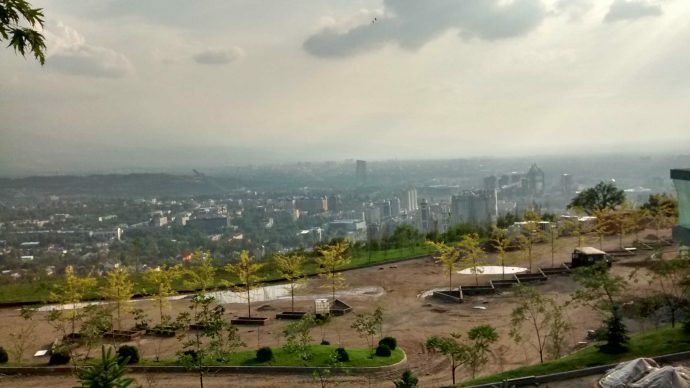 Second, Almaty and its suburbs are growing very quickly, and so do many cities along the range front because it’s just a wonderful location to live at. Many scarps are therefore obscured by recent housing developments, agriculture, or infrastructure. The Big Almaty Canal, for example, was built directly on the fault scarp in a number of places. Thanks to pre-canal, de-classified spy satellite imagery (Corona) we could identify the scarps even where they are gone today. In Almaty downtown, modern high-resolution satellite data helped us to identify a scarp of 5-7 m height. Arrows mark the location of the scarp in Almaty city centre. Based on the length of the surface ruptures that we found and the offsets we estimate that earthquakes with a magnitude of at least 6.8-7 have occurred all along the range front and right beneath Almaty. However, judging from historical examples, the quakes may have been much stronger. This is bad news for Almaty which has been severely damaged by strong distant earthquakes about one hundred years ago, but it may also serve as a wake-up call to plan for an even worse earthquake that will surely come one day. 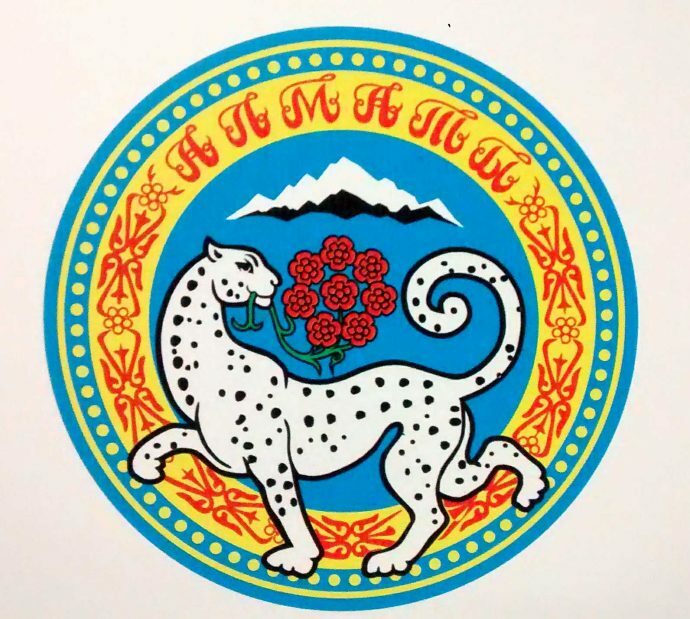 The beautiful city arms of Almaty – a snow leopard in front of the Zailisky Alatau. This work was done for the NERC/ESRC Earthquakes without Frontiers Project and COMET. Grützner, C., Walker, R. T., Abdrakhhmatov, K. E., Mukambaev, A., Elliott, A. J., & Elliott, J. R. (2017). Active tectonics around Almaty and along the Zailisky Alatau rangefront. Tectonics 36 (10), 2192–2226. The accepted version is available for free here. Any idea when a big one will hit here in Almaty? No one knows that. Could be tomorrow, could be 1000 years from now. All we know is that it will happen and that it will be strong.